EIFS installation at the Office of the Future (below). BASF Construction Chemicals, which marks its 10th anniversary this year, stakes claim to having supplied to several regional landmarks such as the Burj Khalifa and Dubai International Airport in Dubai, Ferrari World in Abu Dhabi, the Doha Metro in Qatar and Kuwait International Airport, to name a few. Among the leading chemical company’s latest achievements is the world’s first fully functional 3D-printed office building, dubbed as the Office of the Future, which was completed in Dubai recently. 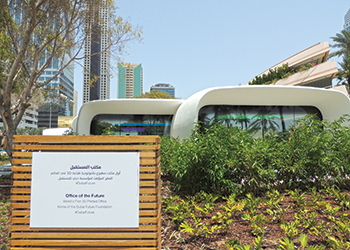 The futuristic workspace serves as the temporary office for the Museum of the Future, currently under construction in the Emirates Towers premises. 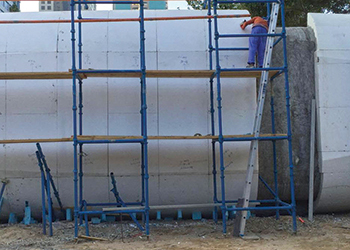 For the project, BASF has provided innovative grouting and anchoring solutions under the company’s Master Builders Solutions brand. These were used to combine various components of the structure together – mainly used for bedding, grouting and void filling operations. BASF says its MasterFlow grouts offered structural stabilisation, and were also used for anchoring and post-tensioning. Repair mortars were also applied to correct the surface imperfections and irregularities of the printed concrete sections. “BASF is dedicated to ensuring a positive social impact through harnessing the best in chemistry and innovation. The company’s contribution to this project reflects the expertise in delivering sustainable construction solutions. This project also marks an important step in expanding our regional footprint,” he adds. MasterFlow grouts, MasterEmaco mortars, Exterior Insulation Finishing Systems (EIFS) and waterproofing solutions were key components in ensuring the structural integrity of the 250-sq-m, arc-shaped engineering marvel, which required scientifically-strong innovations to remain durable and safe. An especially challenging dimension of the project was the inclusion of EIFS. BASF’s Technical Services Team assisted the project applicator expert Golden Elements in adapting this system for the distinctive arc-shaped structure. The architects and designers along with the contractor agreed that for a project as ambitious as the world’s first 3D-printed office, they required technical advisors and experts right from the planning and design stage. It was during this period that they approached BASF for their advanced construction chemicals. Officials from the Ministry of Cabinet Affairs and the Office of the Future thanked BASF for its high-quality solutions which enabled the structural design to become a reality, and in the long run, will help it remain sustainable. BASF was recognised as a valuable partner through all phases of planning, designing and construction of the project. Meanwhile, BASF has expanded its extensive product portfolio with the launch of a new generation of its spray-applied polyurethane foam roofing system Elastospray across the Gulf region. Specifically created for the insulation and waterproofing of roofing systems, Elastospray can be applied to both new and retrofit roofs. Designed with new zero ozone-depleting potential (ODP) and low global warming potential (GWP) hydro-fluoro-olefins (HFO) insulating agents, the new Elastospray meets the most stringent environmental requirements, says the company. Elastospray is produced directly on the substrate to be insulated, using a spray process. The spray foam creates an even layer of insulation, eliminating any thermal bridges. Made to reduce emission levels of volatile organic compounds (VOCs), Elastospray has an extremely low thermal conductivity, making it unique when compared to conventional insulating material. Water and ultraviolet (UV) resistant, the new-generation roofing system is easy to install and extends the lifecycle of roofing systems. Elastospray is available in the region through BASF Kanoo Polyurethanes. BASF Group made the strategic decision to purchase Degussa Bauchemie’s construction chemicals business in mid-2006 to create what is today known as BASF Construction Chemicals. Over the years, this acquisition has proven to be a valuable add-on to the BASF Group’s legacy in providing sustainable solutions to a wide range of industries. Today, BASF’s construction division offers advanced chemical solutions for new construction, maintenance, repair or renovation of structures. It taps the opportunities across the infrastructure and building sectors. BASF Construction Chemicals has thus found considerable success and has steadily grown year-on-year.